The new 62,000 sq. ft. YMCA of Blue Water was part of an exciting new urban riverfront development in Port Huron. Wanting to take advantage of the dramatic riverfront views, the two-acre site required the use of deep foundations constructed on 90-ft concrete piles, supporting a concrete floor slab, as well as individual pool tubs. Adding to the cost of the project, these foundations were deemed worthy in order to capture the inherent excitement of the busy St. Clair River. 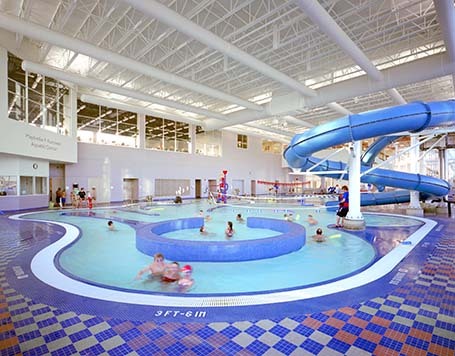 Housed within the facility is an oversized gymnasium, weight/fitness area with views into the aquatic area, a group fitness room, multi-purpose rooms, concessions, a drop-in baby sitting room, locker rooms with a special needs section, and a childcare center for 100 children complete with an outdoor playground.